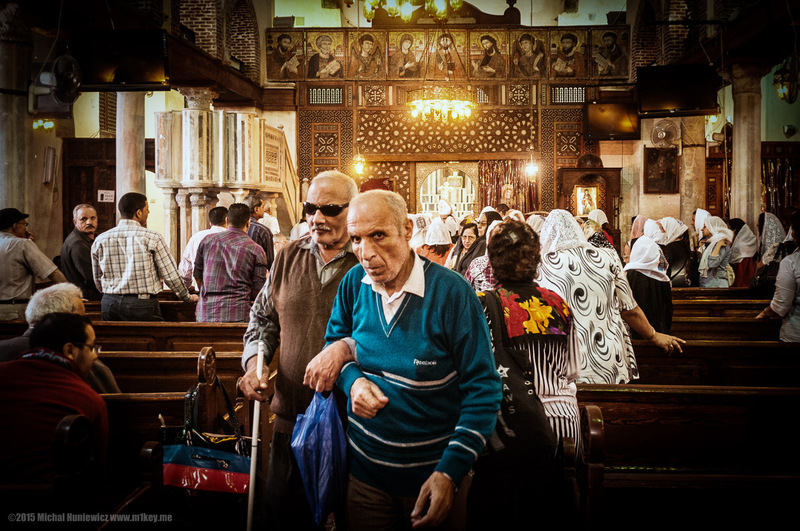 This is my second photo gallery from Egypt, focusing on ancient and Coptic Egypt. 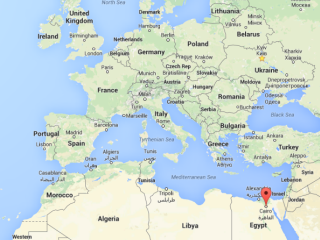 The previous one was on Islamic Egypt. Sources: 1,	2,	3,	4,	5,	6,	7,	8,	9,	10,	11,	12,	13,	14,	15,	16,	17,	18,	19,	20. 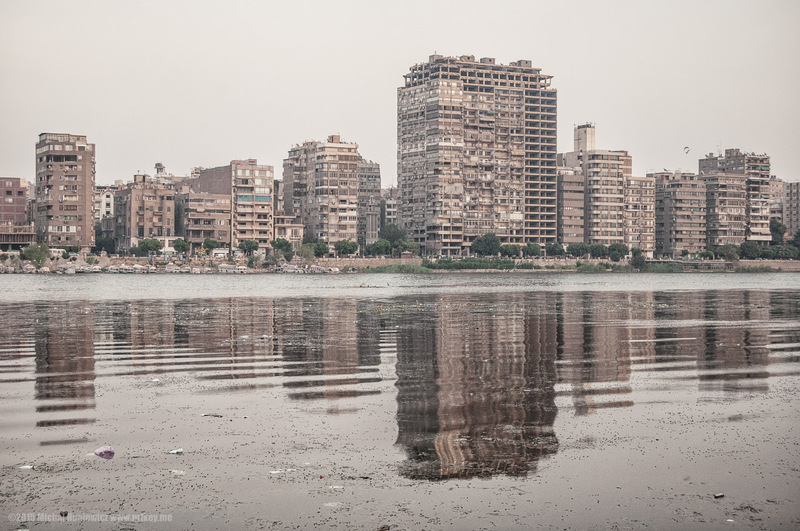 This is what I first saw when I woke up in my hotel room - my first morning in Egypt. 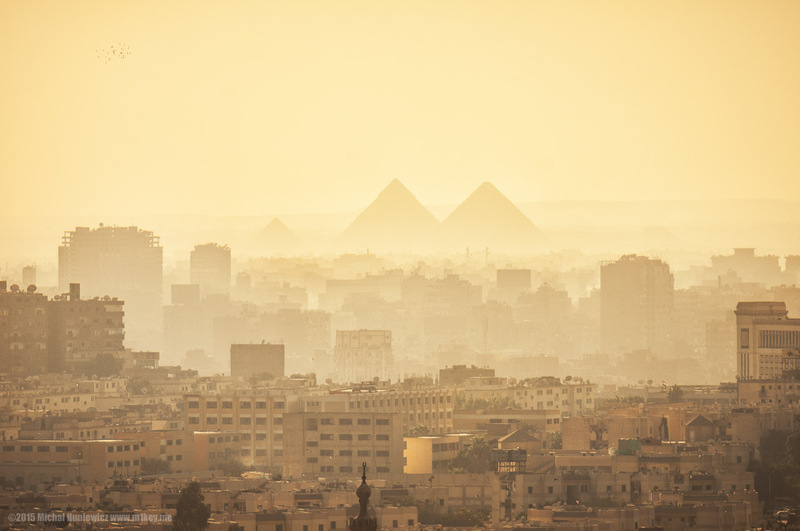 The ancient Egyptian burial ground in Giza, west of Cairo. Absolutely stunning. ISO 200, 50mm, f/10.0, 1/800s. 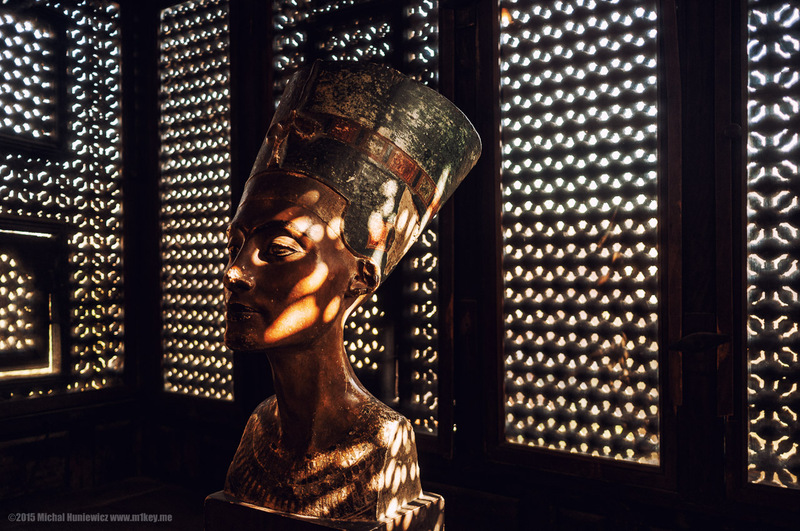 I initially said this was Cleopatra, but I was corrected - thanks to Kelly Patterson. ISO 200, 20mm, f/2.8, 1/200s. 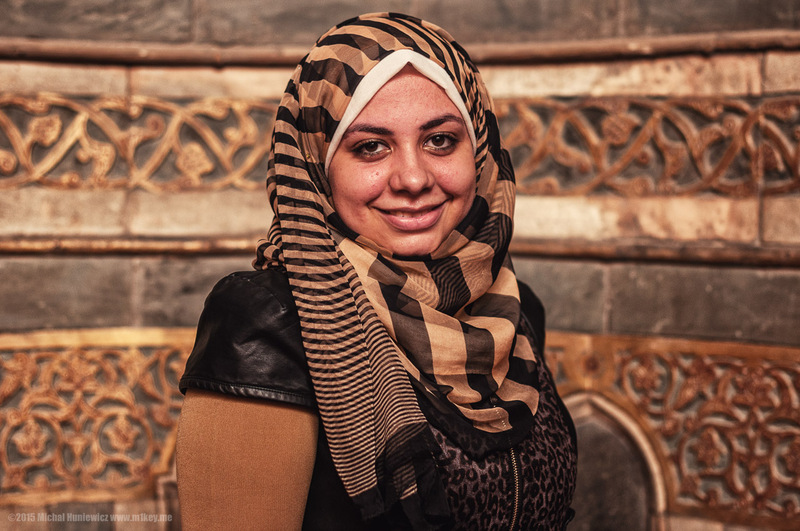 Girl I met in the Saladin Citadel; she took a photo of me as well. ISO 200, 50mm, f/1.4, 1/8000s. 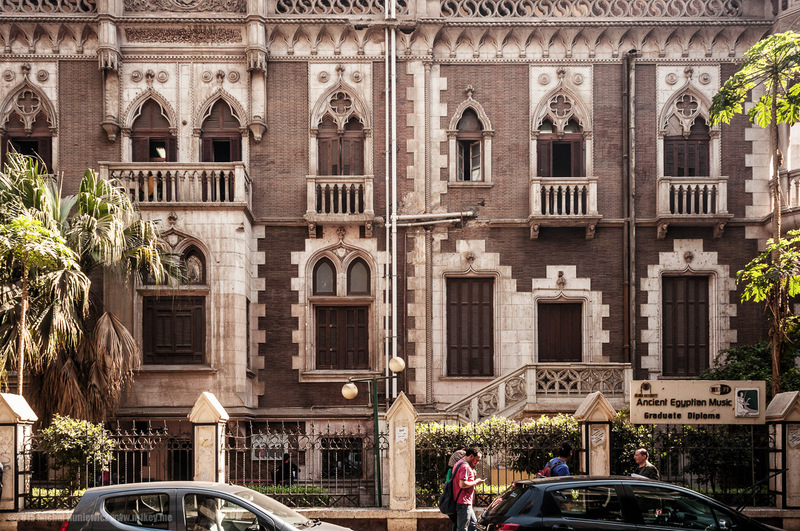 Located in Zamalek (where I ventured in search of healthy food - found one salad bar), this building shows both Gothic and Mediterranean influence. I love those wooden blinds, but there's not much use for them where I live. 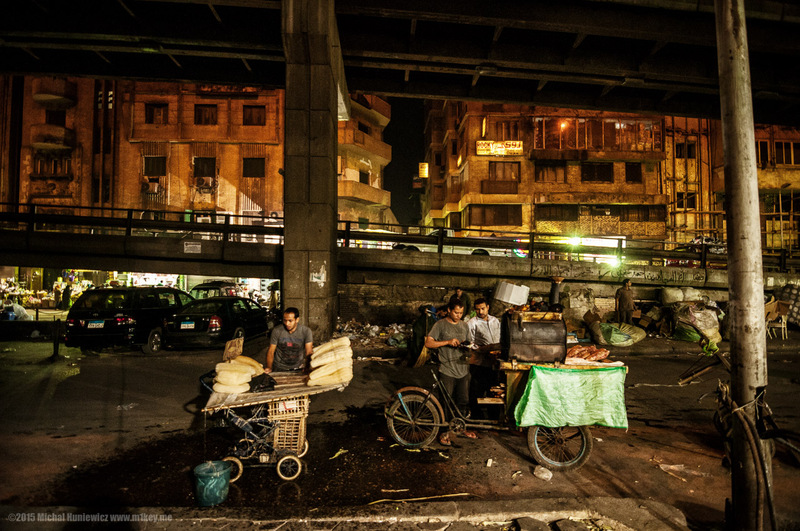 Many other neighbourhoods in Cairo are poorer and more conservative than the island of Zamalek. ISO 200, 20mm, f/5.0, 1/250s. Islamic Cyber Punk-style neighbourhood. Only the rain was missing. ISO 800, 11mm, f/2.8, 1/25s. 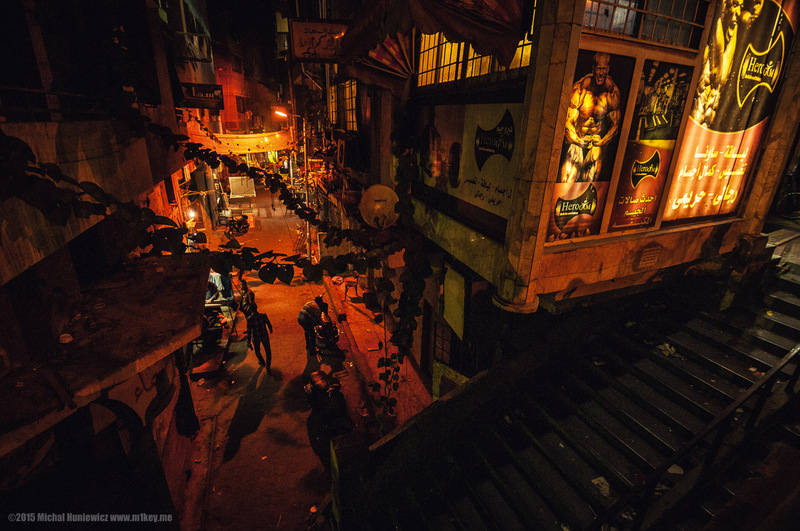 One of the more atmospheric streets - modern Arabic Nights. Maybe except for the ads! ISO 800, 11mm, f/2.8, 1/30s. 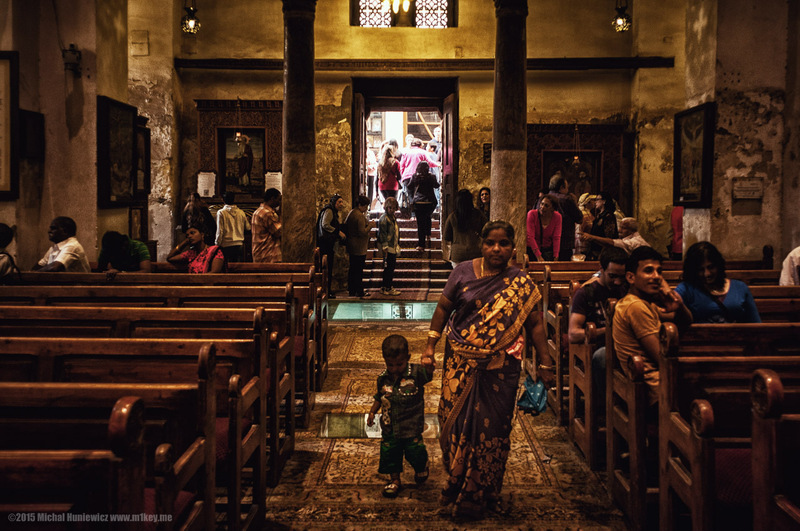 From the street we teleport directly into the sanctuary of a Coptic church in Old Cairo aka Coptic Cairo. ISO 800, 20mm, f/2.8, 1/30s. 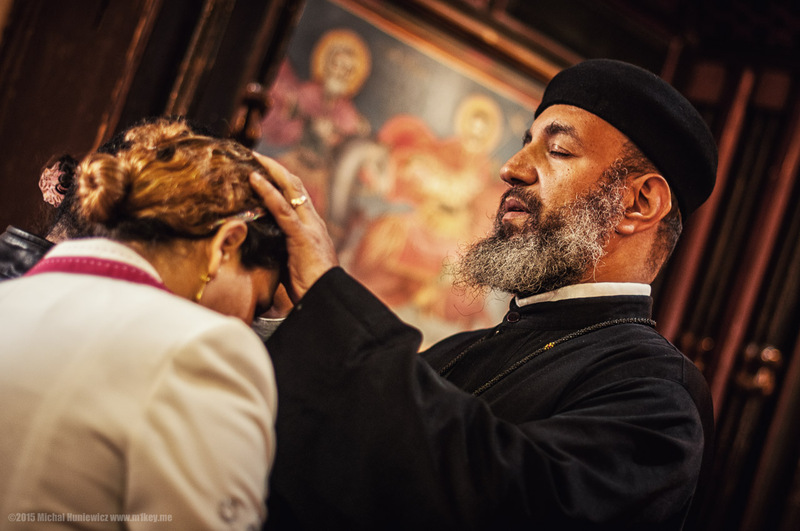 Although their main body for 16 centuries has been out of communion with both the Roman Catholic Church (in Rome) and the various Eastern orthodox churches, Coptic churches feel a lot like Orthodox churches (as opposed to Catholic churches). ISO 560, 20mm, f/2.8, 1/40s. ISO 280, 20mm, f/2.8, 1/40s. When I saw the blingy necklace, I knew he wouldn't mind posing. ISO 200, 20mm, f/5.0, 1/500s. 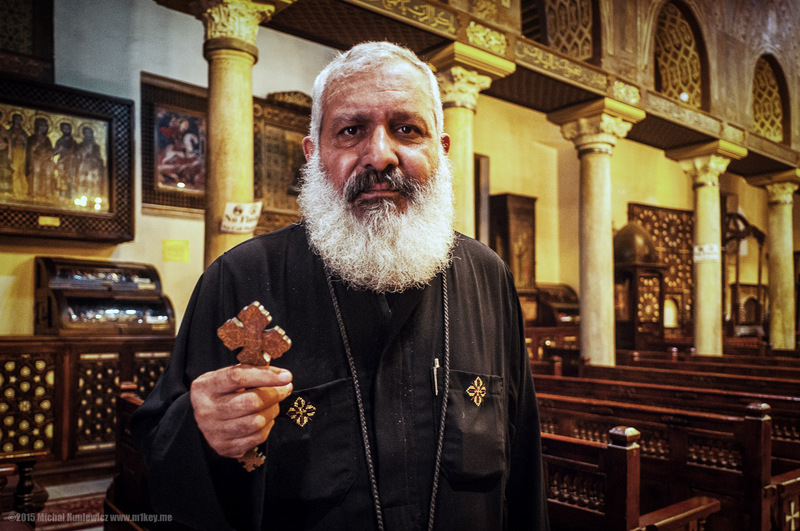 Following the 2013 coup in Egypt, Muslim Brotherhood was hard at work fomenting hatred against the Copts, and as a result, there were widespread attacks on Coptic churches and institutions in Egypt by Sunni Muslims - the worst since the 14th century, according to some. 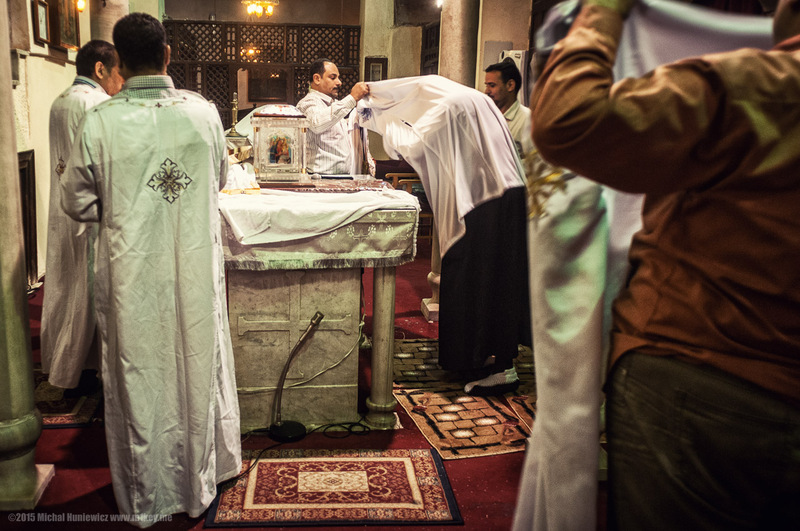 The Copts had been generally supportive of the deposed secular-ish dictator Mubarak, who guaranteed their safety. ISO 800, 20mm, f/2.8, 1/25s. 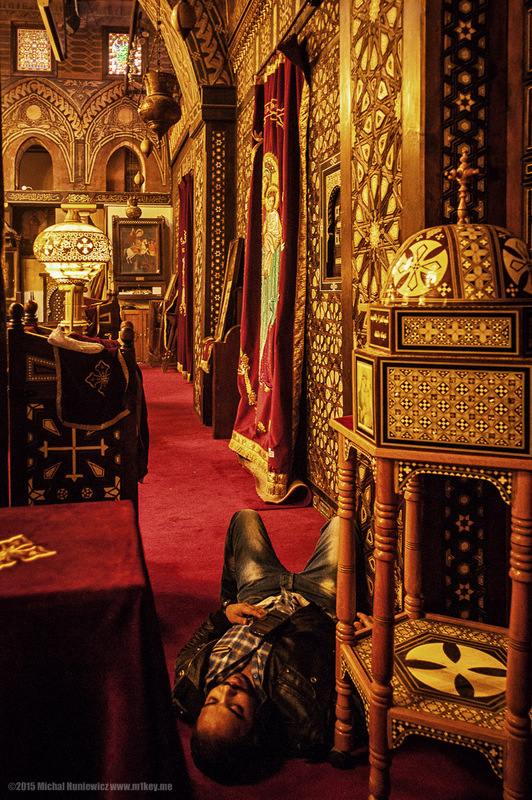 I've only seen people resting on the floor in mosques and Hindu temples - then I noticed there was someone seemingly asleep right in front of the altar, with his mobile phone close to his heart, as if expecting God to call. ISO 450, 20mm, f/2.8, 1/40s. 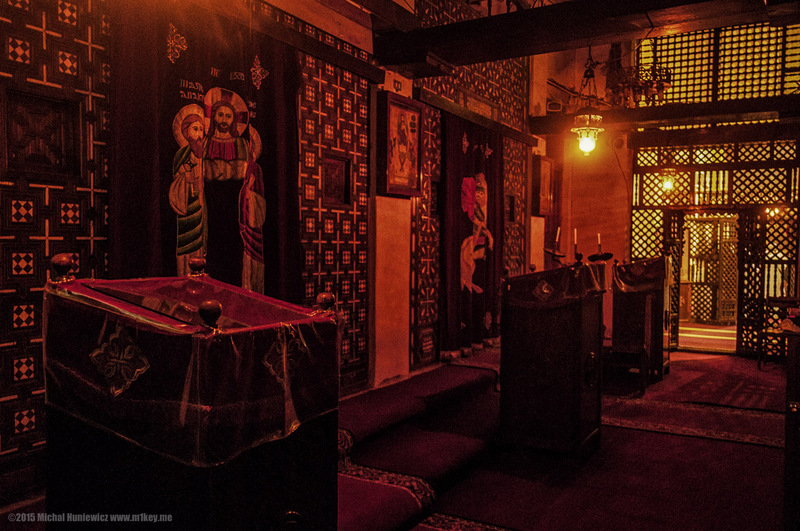 They say Jesus and Mary rested in a crypt located here. Well, as a child, after having received religious education in Poland, I was sure Jesus was Polish... Some people will believe anything. ISO 360, 20mm, f/2.8, 1/40s. 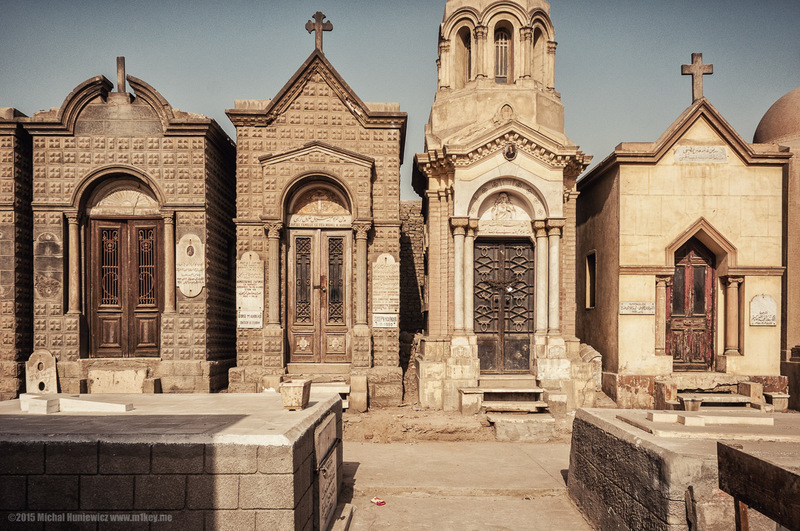 Coptic graveyard in Old Cairo. Not Greek at all, wink wink. ISO 200, 20mm, f/8.0, 1/1250s. 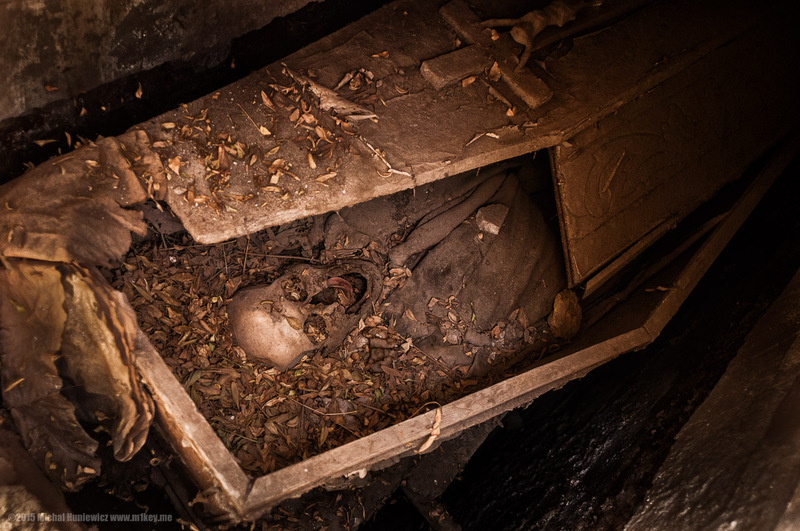 Just like in the atmospheric Rasos Cemetery in Vilnius, here too you can find open coffins with skeletons. This one looked like it was licking its lips with that red tongue. 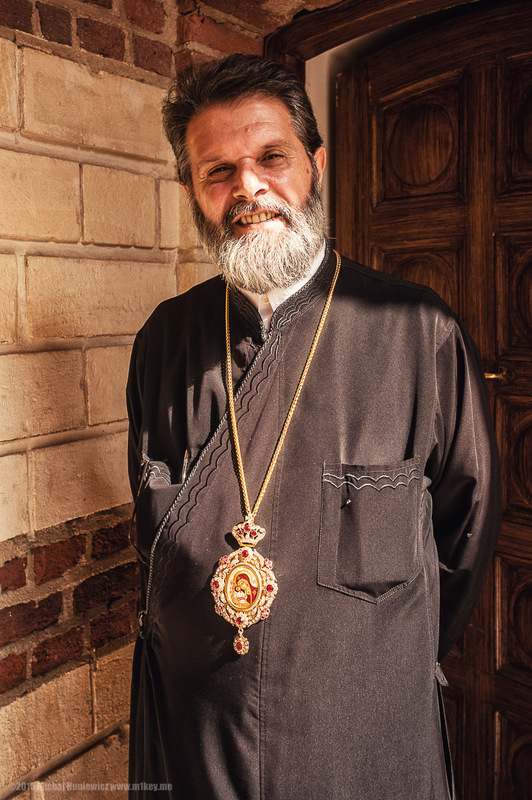 Pictured here, St. George's is a good place to visit if you're into relics. ISO 200, 20mm, f/2.8, 1/6400s. Kid who looked like he was preparing to beat me up. ISO 200, 20mm, f/3.5, 1/1250s. 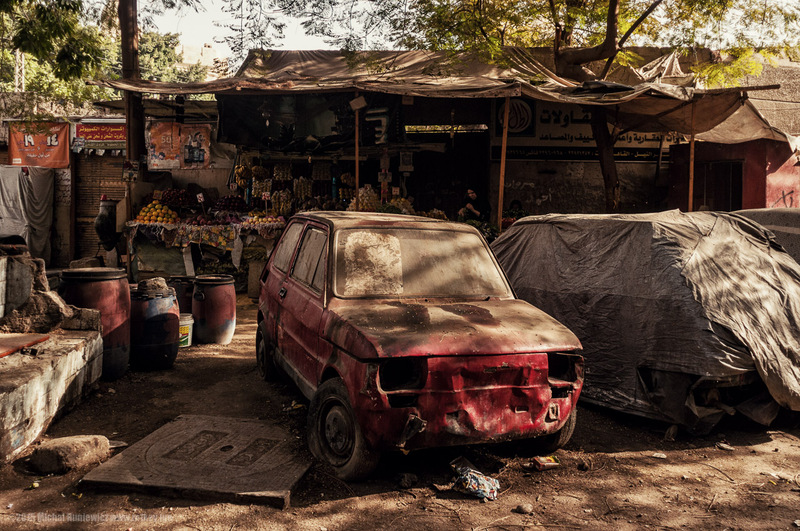 When I was a kid myself, we had one just like that - my dad used to say it was the least safe car in Europe. Nevertheless, as we were sat literally shoulder-to-shoulder in that little vehicle, he would say to me "look, son, this is how Americans drive" (switches on the indicator). "See?" I still don't quite get what he meant. ISO 200, 20mm, f/2.8, 1/1000s. 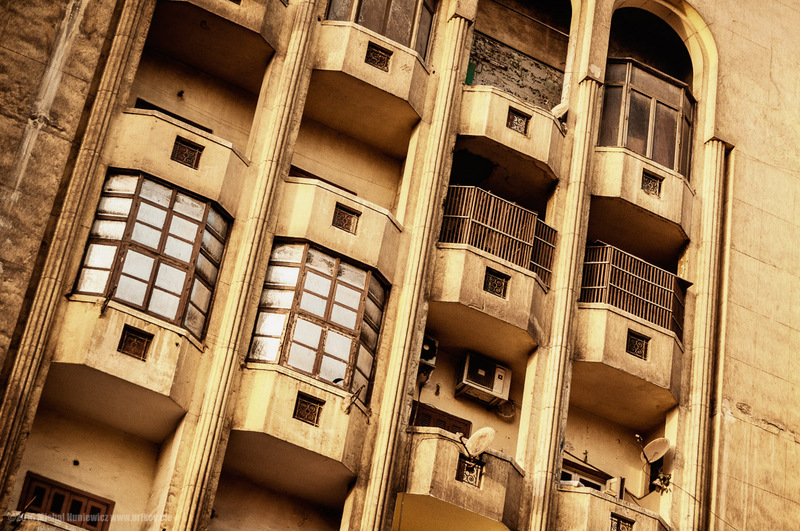 Fortress-like apartment building in central Cairo. ISO 200, 55mm, f/7.1, 1/125s. ISO 800, 40mm, f/5.0, 1/25s. 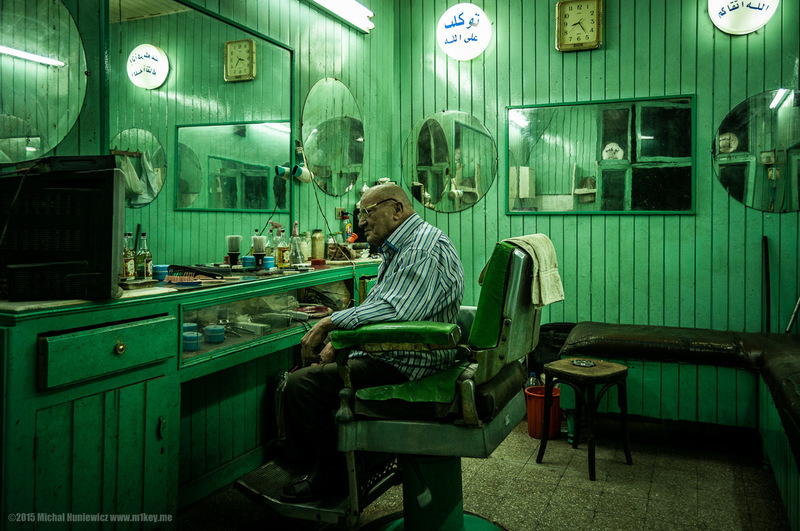 Man in his barber shop. ISO 200, 18mm, f/3.5, 1/50s. I mean, I hope he wasn't dead. ISO 800, 30mm, f/4.2, 1/25s. 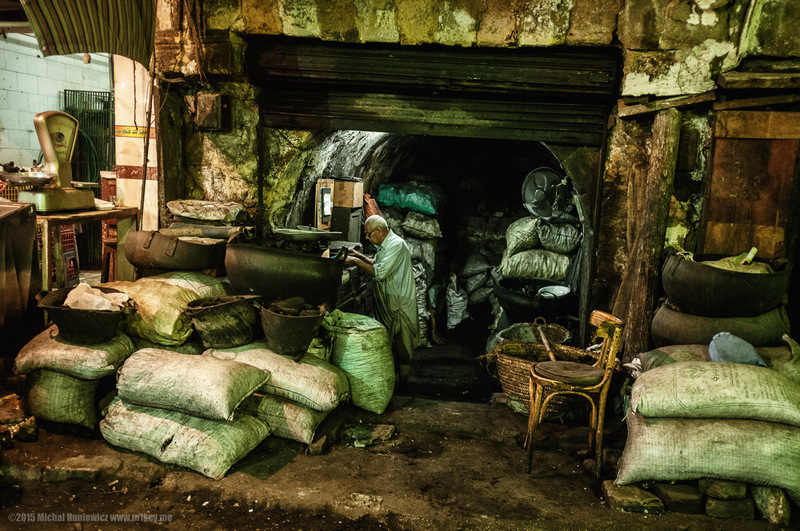 Man selling coal, straight from the mine, by the looks of it. What's the Noise Camels Make? 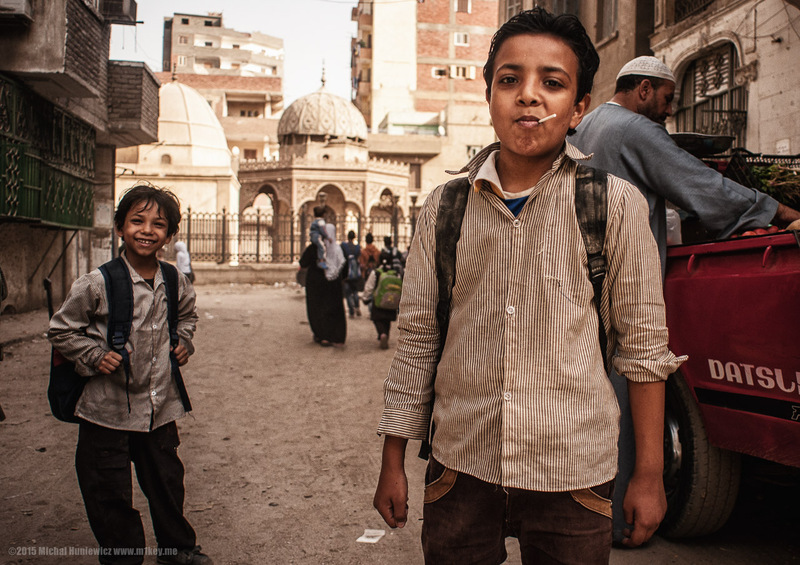 Finally, we return to Giza. 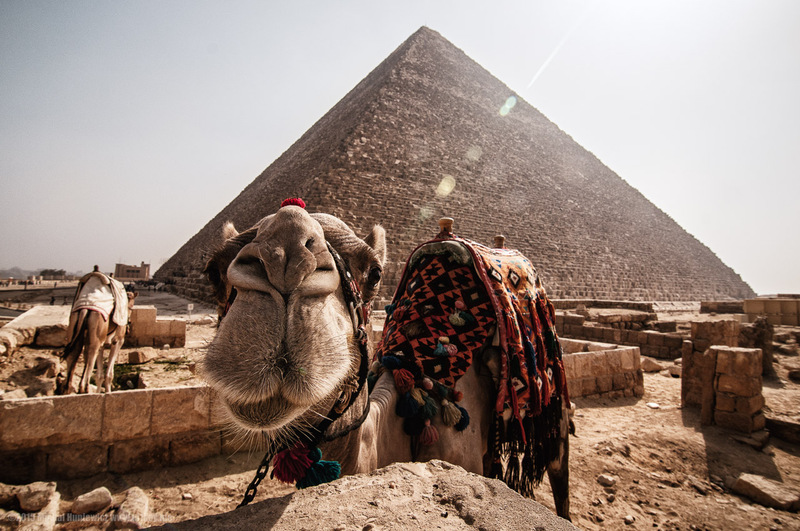 Behind the camel sniffing my lens is the Great Pyramid of Giza aka the Pyramid of Khufu or the Pyramid of Cheops (the Greek name of the Pharaoh). The Geat Pyramid was the tallest man-made structure in the world for over 3,800 years, until it was replaced by the Lincoln Cathedral in London (of arguably inferior craftsmanship, as it didn't last too long ). 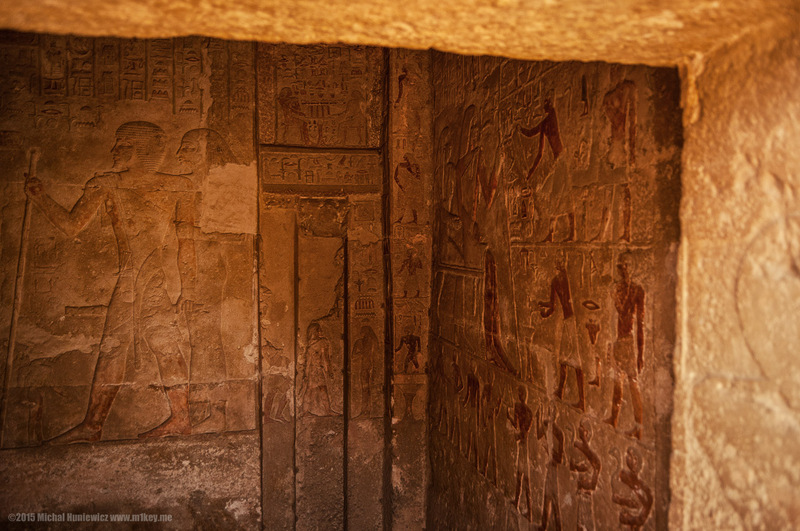 This is inside one of the Saqqara mastabas, that of Mereruka, who was an important government official. 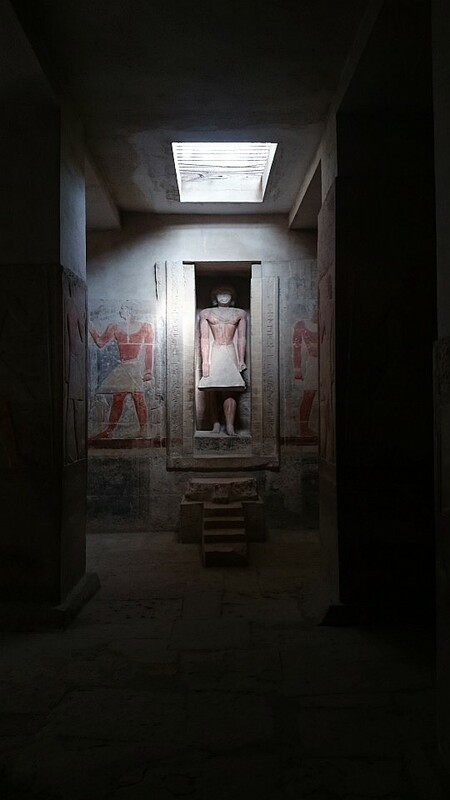 In the photo, you can see his statue, and behind it is a false door, which was a threshold between the worlds of the living and the dead. 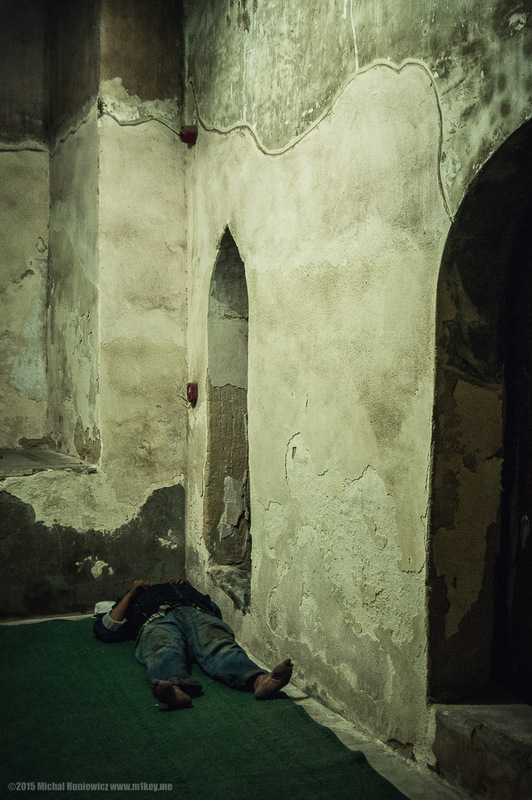 His tomb is quite a labyrinth. You're not allowed to use your camera, so the phone shot is all we've got, sorry. ISO 125, 5mm, f/2.0, 1/32s. Taken with my phone, apologies. When I saw this one... I decided to sneak in, and it was highly claustrophobic. My body was like "no, no!" ISO 200, 18mm, f/3.5, 1/200s. 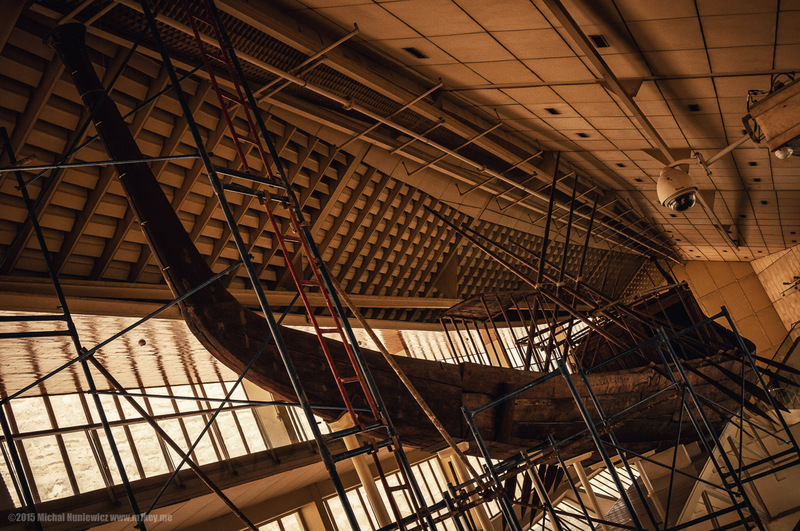 This is the ship of Khufu (Cheops), 4,500 years old, found intact, until fairly recently sealed into a pit at the foot of the Great Pyramid of Giza. ISO 200, 26mm, f/9.0, 1/160s. More rational ideas did not emerge until the Renaissance, when the Catholic Church lost some of its grip on Europe. 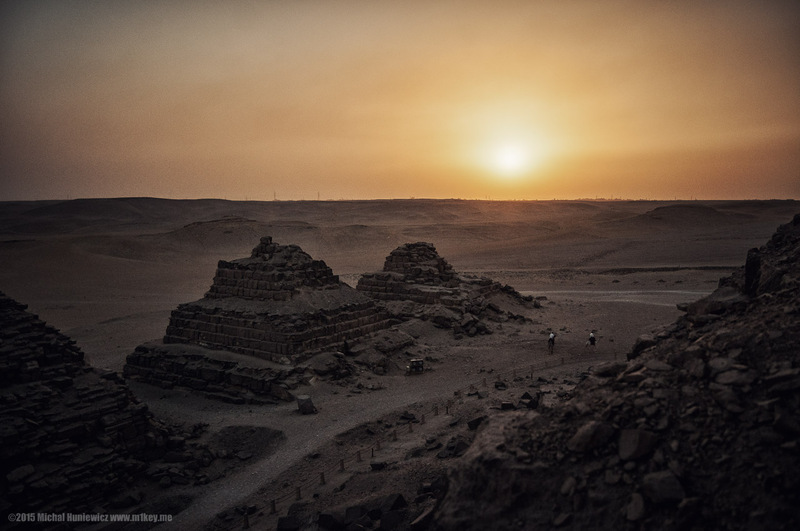 In the photo, the Pyramid of Menkaure and the so called pyramids of Queens. ISO 200, 26mm, f/8.0, 1/500s. These lights are used for a somewhat tacky lights and music show I got to admire from my hotel room every evening I was too tired to go out. ISO 200, 32mm, f/4.5, 1/2500s. 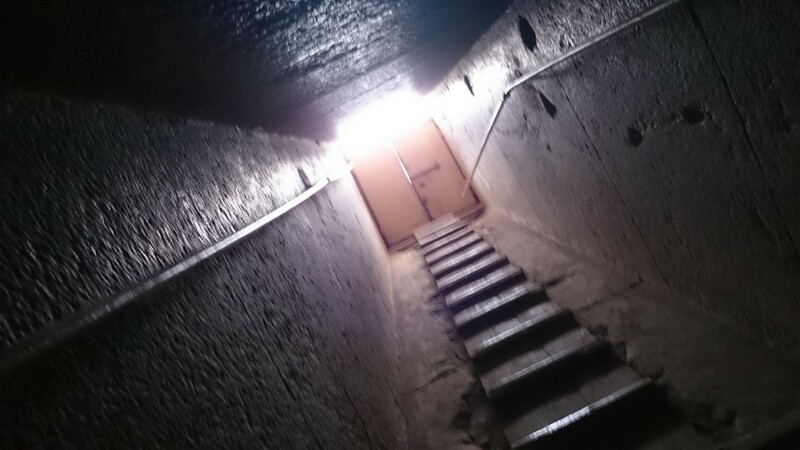 This is what the tunnel looks like inside one of the pyramids. 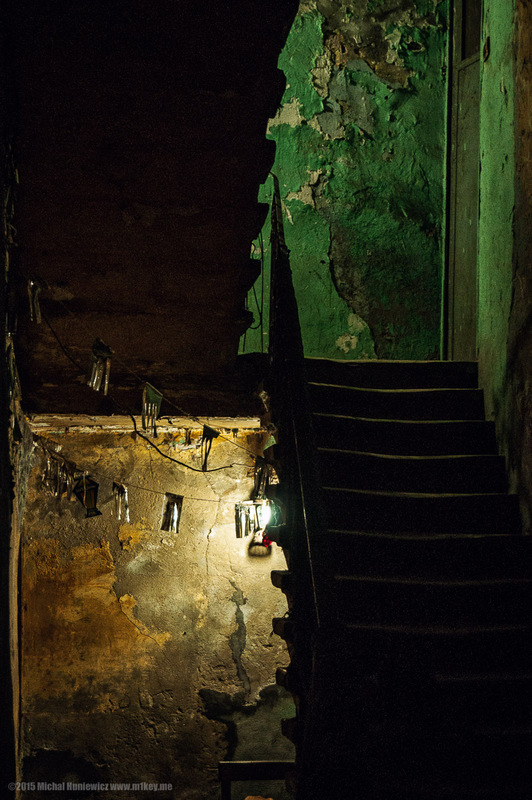 The walls are bare, in most cases they are not decorated in any way. 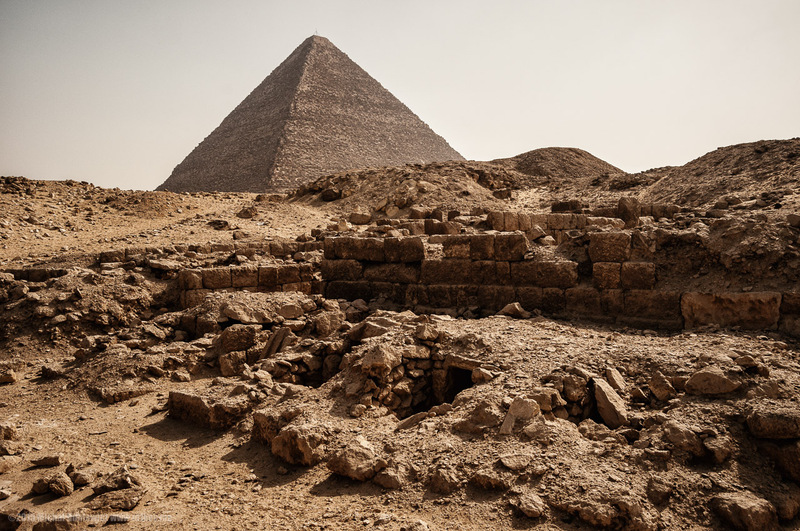 The main security feature of any pyramid was the fact that the entrance was hidden by a stone slab and the pyramid was covered in limestone (so they used to be really brilliant in the the sun; they used to look quite different to what we are used to). That, and the guards. 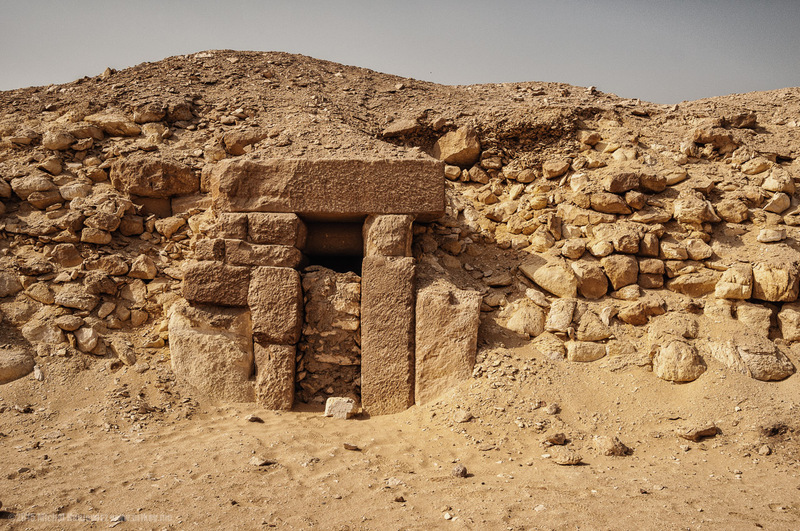 It did not work so well, so the burials moved to the Valley of the Kings. ISO 250, 18mm, f/3.5, 1/20s. 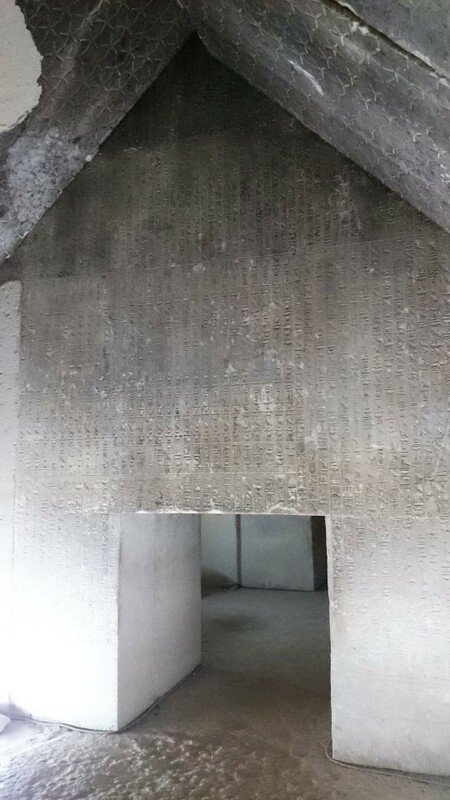 The pyramid of Unas is an exception in terms of decorating - the walls all bear various inscriptions. Yet again, apologies for the quality of this shot, they told me to leave the camera outside, so I had to use my phone. ISO 1000, 5mm, f/2.0, 1/32s. Taken with my phone, apologies. 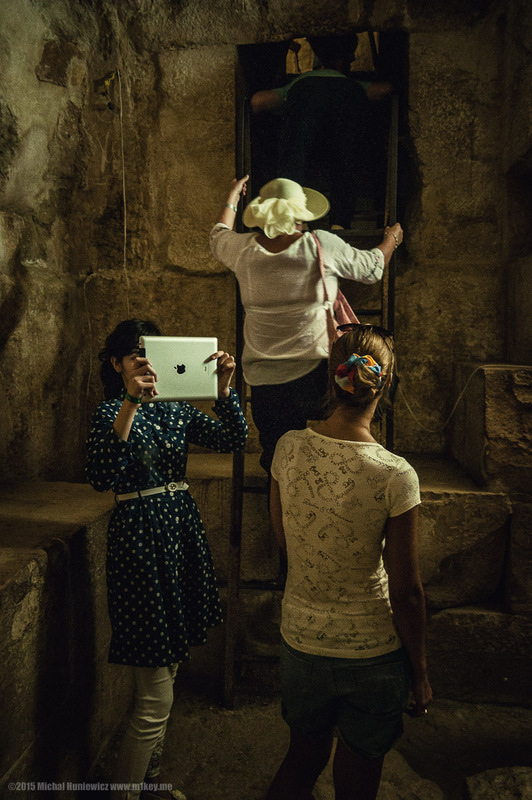 Tourists inside an underground funerary chamber beneath one of the pyramids. 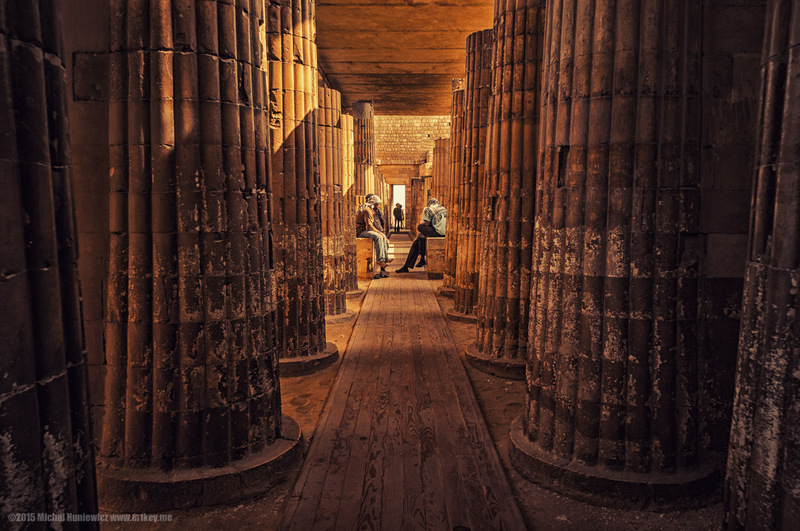 In most cases, the chambers were under the pyramid and not inside, the Great Pyramid being a notable exception (it's also the most complex pyramid inside). ISO 800, 18mm, f/3.5, 1/20s. 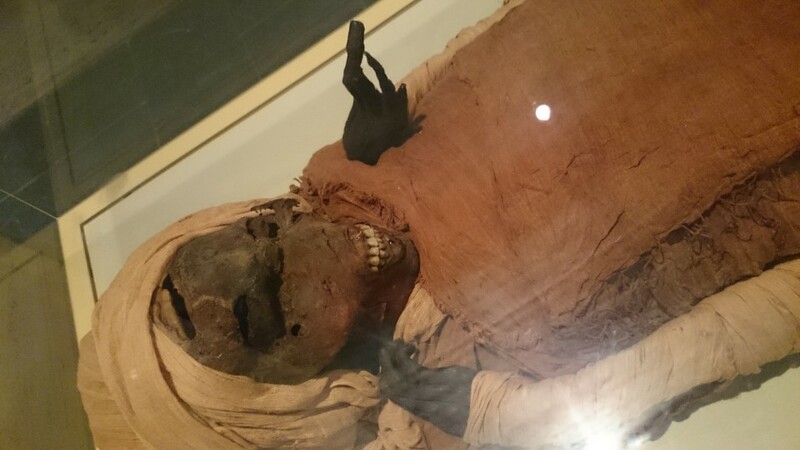 But the fiasco of the entire mummification & life after death project becomes completely apparent once you visit the Egyptian Museum in Cairo. 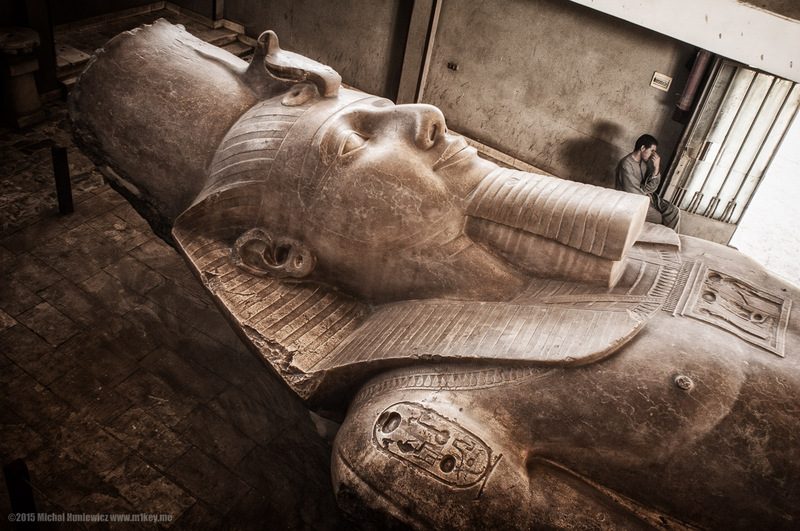 There are plenty of human and animal mummies to admire there, all dead, including that one of the big boss, Rameses II. Once again, you're not allowed to use your camera, so the phone shot is all we've got, sorry. ISO 1000, 5mm, f/2.0, 1/20s. Taken with my phone, apologies. ISO 640, 5mm, f/2.0, 1/16s. Taken with my phone with a shaky hand, apologies. 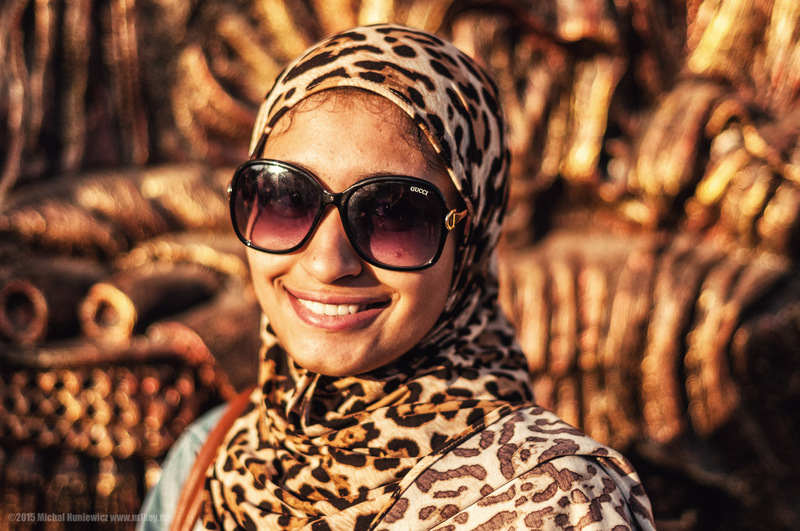 Girl I met, wearing a scarf that reminded me of the headwear Pharaohs used to wear. ISO 200, 50mm, f/2.0, 1/100s. Not much is left of the ancient city of Memphis, but there is a small museum with this impressive statue of Rameses II, possibly the most distinguished of Pharaohs. ISO 200, 20mm, f/5.6, 1/50s. 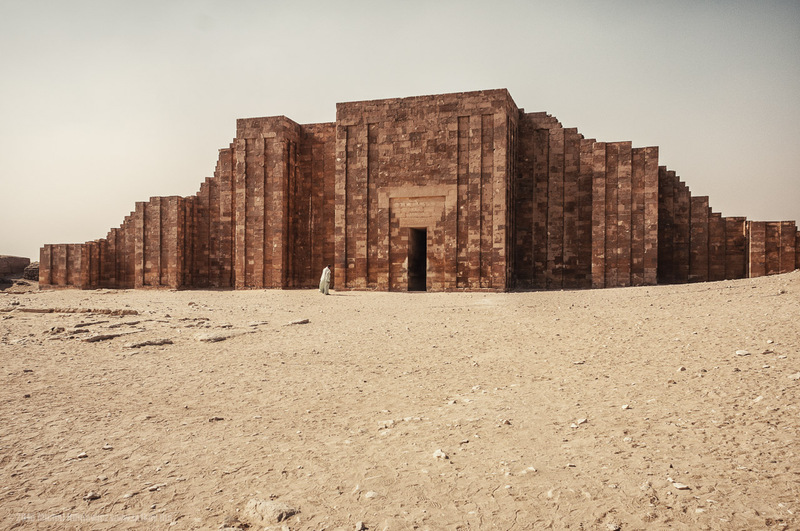 The Funerary Complex of Djoser, featured in Slayer's videoclip for "Seasons in the Abyss". Tom Araya hasn't aged at all! Now that I'm looking at it, Mereruka is in the clip as well. ISO 200, 20mm, f/8.0, 1/1600s. In the photo, the colonnade inside the complex. 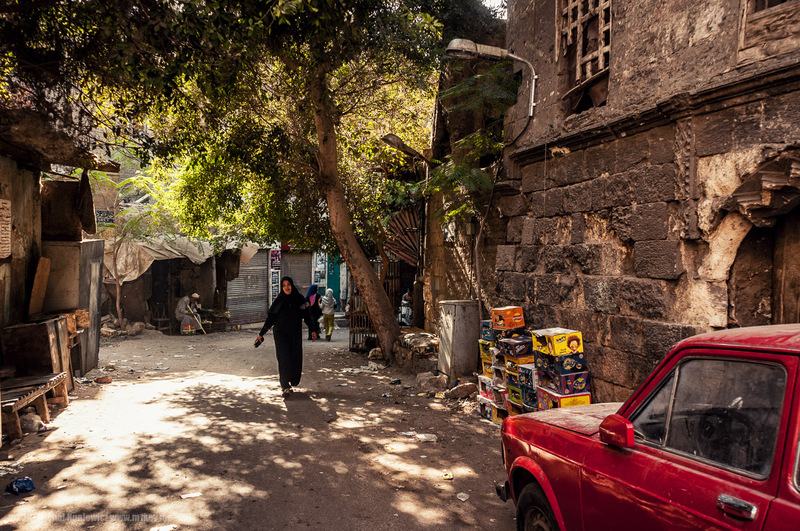 In Alexandria. The girl who went to the Cavafy museum with me, unfortunately I forgot her name, even though she was really helpful. 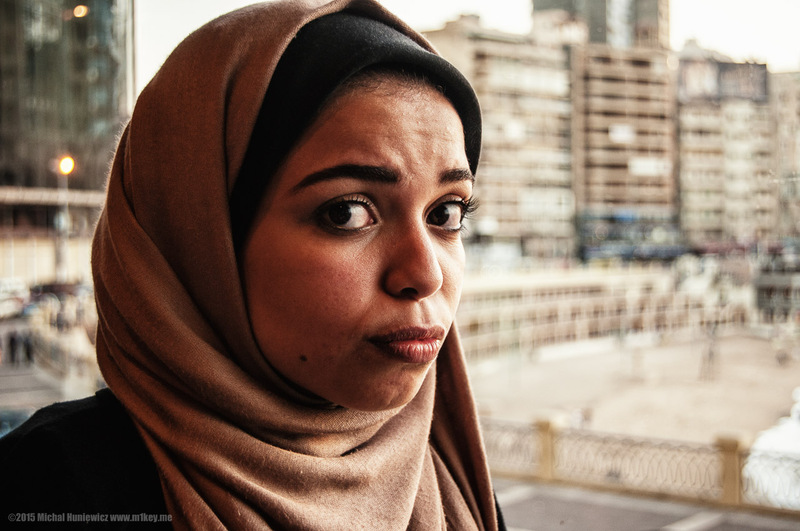 I gave her a book of the poet, who, being Greek, Jewish, and homosexual, is obviously not terribly popular in Egypt. ISO 320, 38mm, f/4.8, 1/40s. Joseph Campbell said that there is a correlation between the size of buildings and the importance we give to the concept behind them. We used to build enormous cathedrals (when religion was most important), to be replaced by government buildings, to be replaced with huge skyscrapers where business is conducted. I wonder if that's true - if it is, it's interesting to see how insignificant the mosque looks in this photo among other buildings. ISO 280, 38mm, f/8.0, 1/40s. 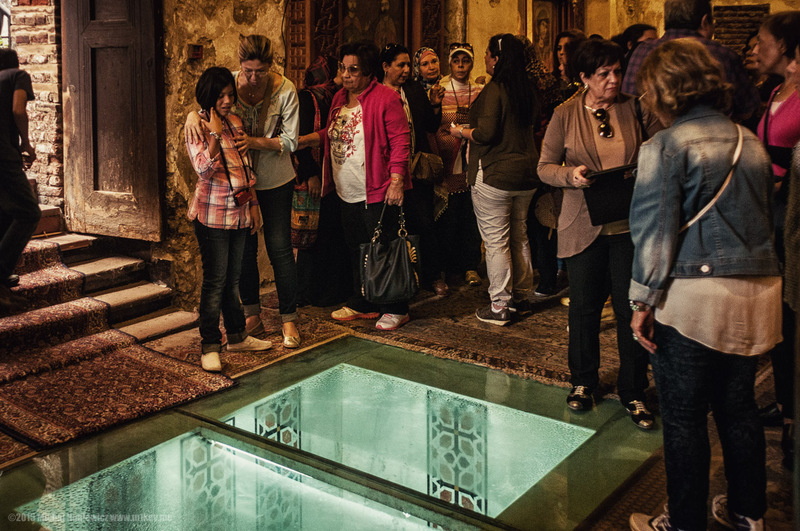 Look at the threshold at the Khanqah and Mausoleum of Sultan Faraj Ibn Barquq. 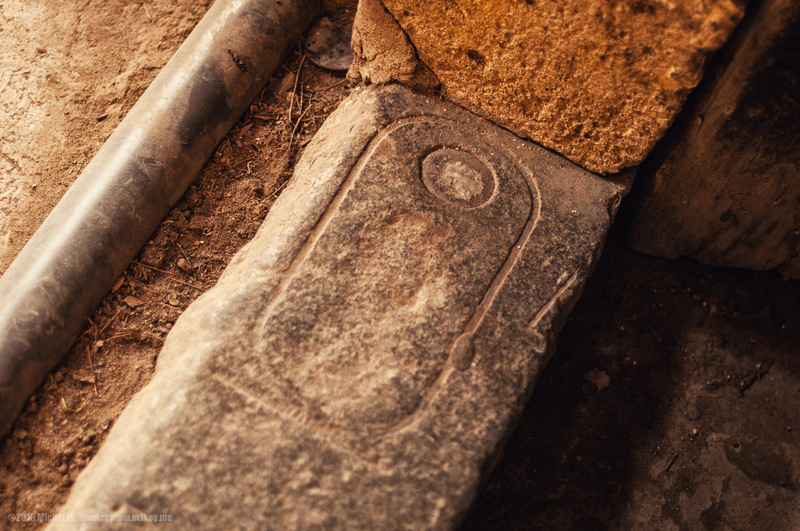 The cartouche is still visible. 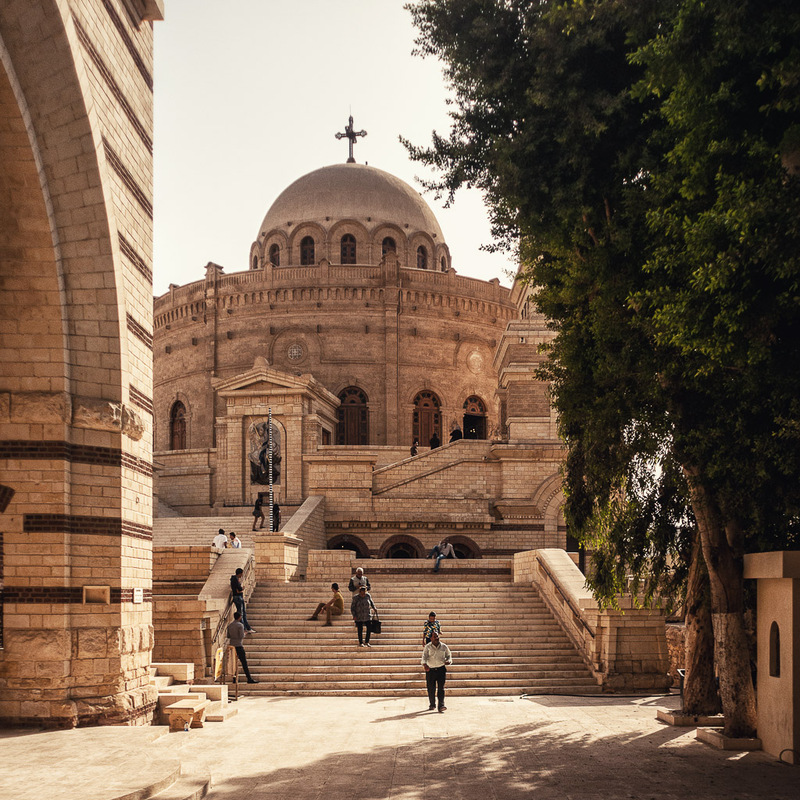 While it wasn't uncommon for Muslim architects to use ancient Egyptian, Greek, Roman, or Coptic materials, here they decided on a somewhat unsophisticated use of ancient Egyptian materials - as a threshold for the Muslims to step on, to symbolically denigrate the pagan faith of their predecessors. Another example of this sort of cultural imperialism is the Dome of the Rock in Jerusalem, towering over the entire Old City. ISO 200, 50mm, f/1.4, 1/80s. 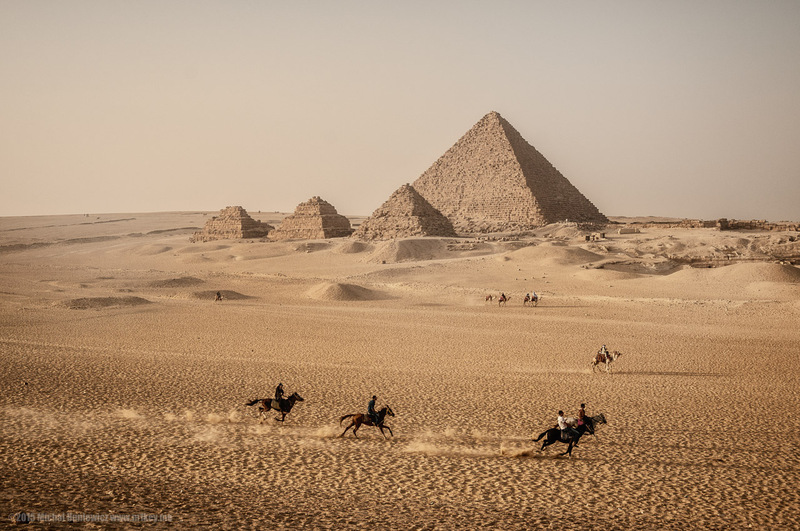 But the pyramids still stand, majestic and awesome. 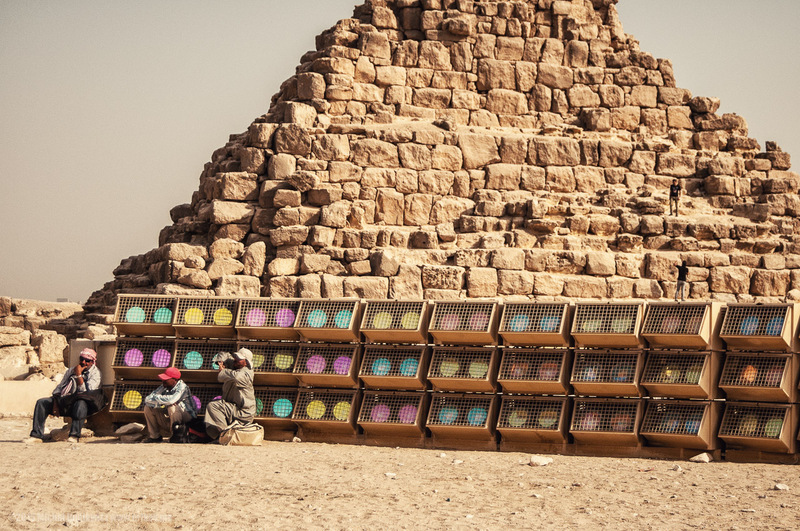 Everything fears Time, only the pyramids laugh at it. ISO 200, 210mm, f/5.6, 1/2000s. But they're not entirely safe, because idiots want to climb them. Idiots like me. 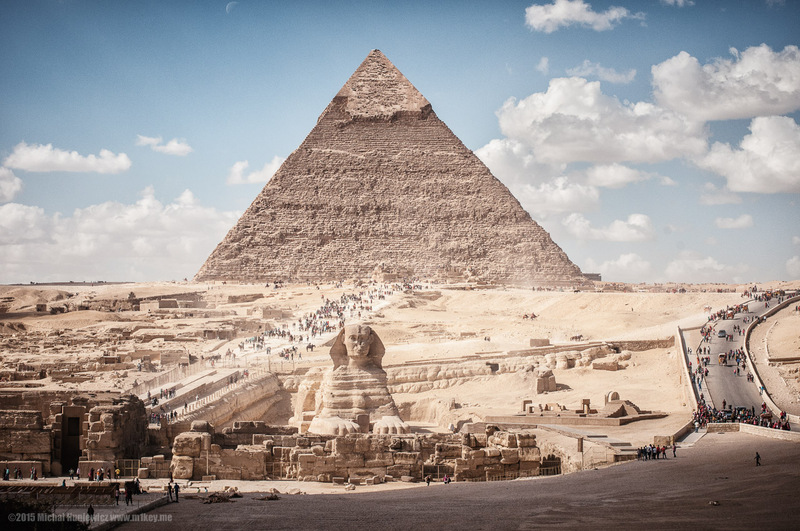 Climbing a pyramid is surprisingly hard. I'm not quite sure why I even did that, but it was all going well until... the camel police showed up. My bravado came to an end in an instant, I was frozen in fear on the pyramid, as they took their time at the foot of the structure. I was just hoping they would see my already so that the stress of waiting would end. They didn't. In the end, I didn't climb the whole thing, I was too scared. 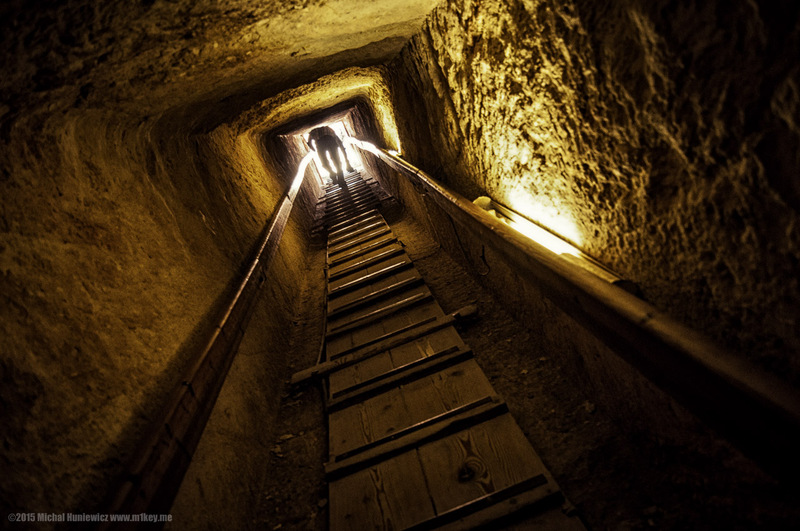 I did climb one of the smaller ones, and then got to explore a few more tombs with bats and sarcophagi inside them. It was almost completely dark when... I got caught by the police, after all, who started screaming at me and brandishing guns. More and more of them started coming from everywhere. Flattery and acting naive saved me, I believe, once again. As we say in Poland, the stupid are always lucky!